Now that the engine is in the car, we've started giving a little thought to the exhaust system. This should be fairly simple on a Locost. 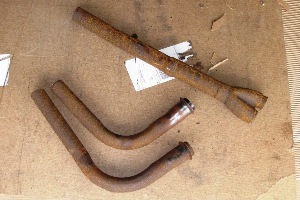 Side pipes, one muffler, one hanger. In our original Locost plans we had intended to ditch the stock exhaust manifold and build something out of an aftermarket MGB header. And we still might, but I wouldn't take bets on us doing it any time in the next several years. The stock manifold will work fine for now, and will greatly reduce the amount of work we need to do, thereby dramatically increasing our chances of not making a huge mess of things. We took a hacksaw to the rusty old donor exhaust pipes. I'm not sure why. I guess I thought it would be good exercise. It was definitely good to see how the folks at M.G. put things together. Oddly, in all our years as shadetree mechanics, we've never done exhaust systems. Ever. It's not like we've never modified an exhaust, but we always had a muffler shop nearby. So the exhaust system in our Locost will be our first, and will therefore not differ significantly from the MGB exhaust, except of course for where the pipes go. The stock MGB exhaust manifold has two outlet pipes. We'll run two downpipes from the manifold out the left side of the car, where they'll join up to a Y-connector. We'll need some bent pipes for that, welded neatly together. We'll run a straight pipe from the Y-connector outlet to the muffler, and a 90-degree pipe out of the muffler in front of the rear fender. The two downpipes will be bolted to the manifold using the stock flanges, and we'll somehow arrange things so the complete exhaust system can be extracted as a unit from the car, should that ever be necessary. To get things started, we bought a couple of 1.75" exhaust tubes, which is the size of the exhaust pipe on the donor, as best we could measure. It turns out the tubes we bought have a 1.75 O.D. at one end and a 1.75 I.D. at the other end, which lets you slip the pieces together, overlapping them before welding. 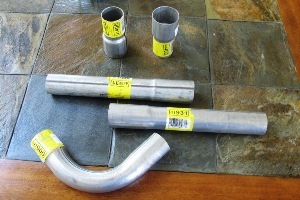 That seemed like an outstanding feature, so we ordered several more tubes like that, some straight and some bent. We also ordered a muffler, and as soon as it all arrives we should be able to piece the whole thing together without too many mistakes. While we waited for muffler parts, we needed something equally exciting to work on, so we started paneling the interior. We bought some 18 and 20 gauge steel for this months ago, without giving much thought (and by "much" of course we mean "none") to how we would attach it to the frame. There are several methods for doing this, including welding and riveting. Okay, just two methods. Of course some people screw the panels to the frame tubes, but that's not really a new method, just a variation on the rivet theme. We decided to weld our panels in place. We think riveting won't impart the sort of torsional rigidity we're looking for. We're not a hundred percent sure it's possible to weld 20 gauge steel, but we'll find out soon enough. In any case we don't have to worry about that now because we're not going to weld anything until the chassis is stripped to the bone. But we thought we might get a head start by cutting and trimming all the panels to fit now. It turns out that trimming is the biggest part of the job. You can't just slap some sheet metal on there, cut off the edges with a pair of tin snips, and call it a day. You have to start with a piece of cardboard, because cardboard is a lot easier to work with. It's more flexible, and you don't need an angle grinder to cut it. Also, if at some point you totally mess up and cut too much off, you can throw the piece away and start over without suffering a huge financial setback. Depending of course on where you buy your cardboard. 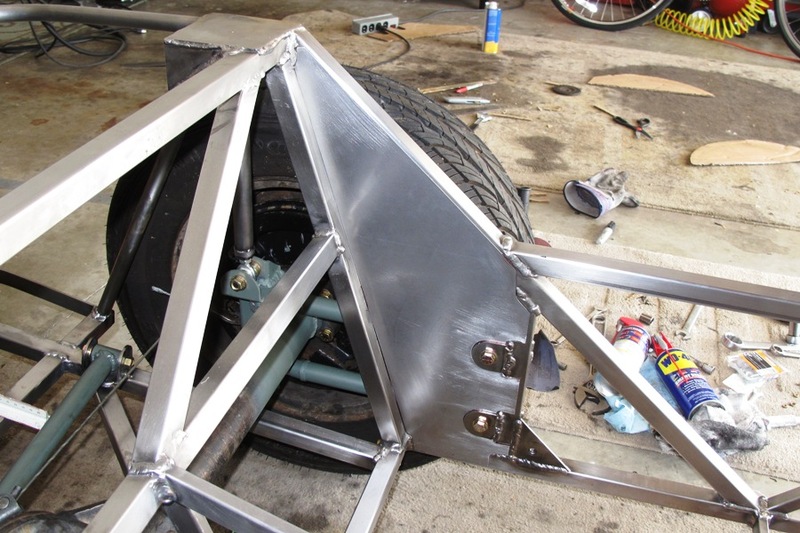 We started out sheeting the rear wheel openings. We only needed a single piece of cardboard for both sides, the openings having miraculously ended up the exact same size through some sort of odd sleight of hand. The panels were a little tricky because they needed cutouts for the rear trailing link brackets, which protrude slightly into the passenger compartment, and also cutouts for the intersecting tubes, and all of the weld beads, which ended up at about 20 cutouts in all, each one painstakingly cut and filed to fit. Luckily we budgeted many, many hours in our build plan for sheeting the frame. We like how the side panels turned out, even though square footage-wise it doesn't look like a huge accomplishment. Still, it's a good start, and the experience should serve us well when it comes time to sheet the transmission tunnel. Which may be soon if our exhaust parts don't arrive in the next day or two.